Up to two-thirds of kidney tumors diagnosed today are detected incidentally in asymptomatic patients, and up to half have a diameter of <3 cm. Their tendency to grow is usually low and up to 14% may actually be benign (72-75). As they are also frequently detected in elderly patients with significant comorbidity, there is a material interest in less invasive treatment modalities than the standard surgical procedures. Well over a third of these are in a peripheral, exophytic location that render them well discernible by ultrasonography and accessible to an energy ablative approach. Percutaneous techniques using either cryoablation or thermal coagulation are widely employed for this today but the need to puncture the tumor with the potential risk of hemorrhage and tumor spillage raises some caveats. Transrectal high-intensity focused ultrasound systems operating in the 4MHz range have been modified for laparoscopic use. In porcine kidneys they permit reproducible partial kidney ablation with no damage to surrounding structures (76), especially when fitted with an integrated 6.5 MHz imaging transducer. For extracorporeal high-intensity focused ultrasound ablation, however, penetration at this frequency is too short, even in small laboratory animals (77). In the 1-1.5 MHz frequency range, the penetration of the transducer increases and the focal zone becomes more cigar shaped. Chapelon et al. (78) and Watkin et al. (79) were able to obtain significant renal lesions with an extracorporeal approach in vitro and in vivo in large animals with experimental systems of this type, but targeting proved difficult and skin burns occurred frequently. Two recent developments seem to have overcome these problems and have revived clinical interest in extracorporeal high-intensity focused ultrasound of renal tumors: the Storz Medical and the Chongqing devices for extracorporeal high-intensity focused ultrasound. 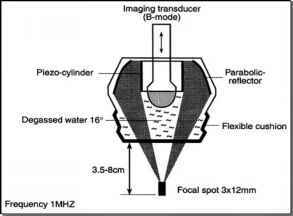 The Storz Medical extracorporeal high-intensity focused ultrasound systemb consists of a cylindrical piezoceramic element generating ultrasound waves of 1 MHz, which are focused at a depth of 10 cm with a parabolic reflector (Fig. 6). A 3.5 MHz ultrasonic transducer is integrated centrally for in-line imaging of the focal area. Ultrasound waves are coupled into the body though a flexible polyurethane cushion filled with degassed water. Electrical power can be increased up to 1.8 kW. The focal zone (pmax/2) has an ellipsoidal shape of approximately 12 X 3 mm in biologic tissues. At 400 W power and penetration through 10 cm of porcine muscle in vitro, this provides calculated site intensities of 1430 W/cm2. In porcine kidneys, insonicated ex vivo reproducible lesions of coagulative necrosis with central areas of liquefaction were obtained, with the size correlating to pulse duration and power (80). Kohrmann et al. (81) tested the system in vivo on the renal parenchyma of kidneys removed for nononcological reasons and observed similar lesions of irreversible tissue damage. In a curative attempt in vivo in a patient with three tumors in a solitary kidney, two were completely ablated by extracorporeal high-intensity focused ultrasound, with a follow-up of six months (81). This prototype has been available at the Department of Urology, University of Vienna, Medical School, for phase II clinical testing since April 2001 (89). 16 kidney tumors in 16 patients were insonicated extracorporeally. 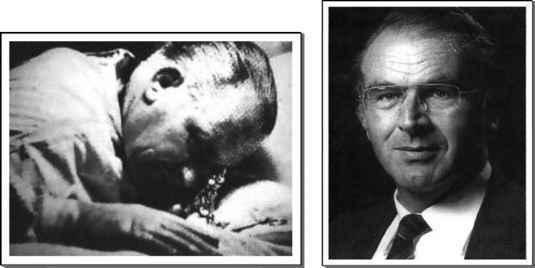 The procedure was always performed in general anesthesia, with attempts to reduce respiratory movement of the kidney by briefly stopping ventilation during insonication. As the treatment procedure is evolving, the treatment parameters varied over time, with electrical power being raised up to 1.8 kW, pulse durations of four or six seconds, and up to 70 pulses administered. The system was also changed technically by increasing the diameter of the reflector from 100-144 mm and changing its aperture from 64° to 84°, reducing its focal length from 10-8 cm, and most notably, by adding a mechanical arm directing the applicator. In two elderly patients, each with a small tumor, the same procedure was performed with curative intent and the entire tumor was treated with 70 pulses of six bStorz Medical System, Kreuzlingen, Switzerland. FIGURE 6 ■ Schematic drawing of treatment arm of Storz™ system for extracorporeal high-intensity focused ultrasound. A cylindrical transducer generating ultrasound at 1 MHz is focused with an acoustical lens to a focus 3 X 12 mm in situ; a flexible cushion filled with degassed water permits a variable focal length of 3.5-8 cm and an integrated B-mode transducer provides imaging of the target area. Source: From Ref. 80.
seconds duration at 1.8 kW. Follow-up magnetic resonance imagings showed some shrinkage of the tumor in one patient, but no complete radiological remission. In the other patients only a lesion of 10 X10 mm was targeted in the tumor. The tumors were then removed in the same anesthesia with the standard surgical procedure. Some erythema of the skin were noted in the five patients subjected to the highest doses, but never skin burns. At surgery, all structures appeared normal and specifically no alterations were noted on the surface of the kidney. Macroscopically limited zones of bluish discoloration and focal hemorrhage were seen in the targeted zone in five kidneys. 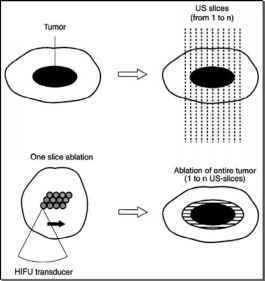 Histological changes suggestive of acute tissue necrosis (82) were detected in the nine tumors that had been subjected to the highest U.S. dose. They only comprised 15-35% of the area targeted, and were considerably smaller than lesions observed with similar energy settings in normal renal parenchyma or experimental studies (80). Nevertheless, the changes were only observed within the targeted area, and surrounding structures always appeared normal. In the Chongqing "high-intensity focused ultrasound" extracorporeal devicec, exchangeable ellipsoidal therapeutic transducers of 12 or 15 cm diameter are mounted around a central 3.5 MHz diagnostic transducer and positioned within a basin filled with degassed water under the patient table. Depending on the transducer used, frequencies of 0.8, 1.2, and 1.6 MHz, and focal lengths of 100, 130, 135, 150, and 160 mm are available. The in vivo focal region for the 1.6 MHz transducer was calculated at 3.3 X 1.1 mm, with only minor differences for the other transducers. In situ intensities are estimated as ranging between 5.000-20.000W/cm2 (83). Ablation can be achieved by placing individual lesions side by side as with all other systems, but the device also has the capacity to achieve more rapid ablation through "painting out" the target area in sequential linear tracks. Smooth, three-dimensional movement of the activated transducer enables this process, and by exposing the same target area 2-6 times, the volume of ablated tissue increases in a linear fashion (Fig. 7) (83). At these energy levels cavitation processes are clearly also involved, but detailed experimental and clinical studies provided no evidence for tumor cell dissemination (88). Because of the high in situ intensities used, treated tissues become hyperechoic on ultrasonography and this effect is used for on-line targeting and feedback. Wu et al. (84) have employed this system for the treatment of 1038 patients with malignant tumors, mainly of the liver, breast, and soft tissues. In spite of large-volume ablations and reportedly good tumor control, side effects were low, and mainly consisted of fever in up to 20% and skin burns in 5% of the patients. The authors also mention treating 27 patients with renal tumors, and in a more recent report they give details of a subgroup of 13 patients with tumors 2-15 cm in diameter. Patients were treated in anesthesia with a 0.8 MHz transducer with a focal length of 135 mm, at a scanning speed of 2-5 mm and track length of 20-40 mm. At a median treatment time of 5.4 hours and a median 1.3 sessions per patient, the tumors were completely ablated in three patients and between 40% and 70% in the rest (85). A similar system was installed at the Churchill Hospital, Oxford, United Kingdom in May 2002 and has been in use in phase II clinical trials since November 2002. Sixteen patients have been treated in phase II clinical trials, four with renal tumors, and the remaining 12 with liver tumors (88). All patients have been treated under general anesthesia, and respiratory movement is minimized by selective intubation, with ventilation of only the contralateral lung during ultrasound exposures. Acoustic powers of 180-300 W have been cChongqing HAIFU, Chongqing, China. FIGURE 7 ■ Schematic depiction of the treatment principle involved in the Chongqing HAIFU system: The target is dissolved into multiple two-dimensional ultrasound slices at 5-10 mm internal, which in sum establish a three-dimensional image of the target. With directional movement of the transducer, each slice is treated, and the effect is monitored by immediate reimaging thereafter. Source: From Ref. 83. The process of developing a thermal lesion by high-intensity focused ultrasound in vivo, over sound propagation and absorption to heat generation, con duction and adequate temperature distribution, is subject to a multitude of variables. These are especially difficult to control with high-intensity focused ultrasound of renal tumors. used, and the most common exposure regime has been the placement of single lesions adjacent to one another (with an overlap of half the transverse diameter of the focus). Maximum transverse diameters of the target renal tumors have ranged from 2.5-5.4 cm, and according to the trial protocol, only a proportion of each renal tumor was exposed to high-intensity focused ultrasound. Estimated treated volumes range from 4.0-8.0 cm3. No skin burns were seen despite the high exposure powers, and the most significant adverse event reported has been a transient bruising sensation. Magnetic resonance and color Doppler imaging after two weeks provided an early indication of the treatment outcome, and following an interval of approximately six weeks post-high-intensity focused ultrasound, three of the four patients with renal tumors progressed to surgery. At the time of high-intensity focused ultrasound treatment, the hyperechoic changes on ultrasonography, which are characteristic of successful ablation, were not seen in any of the treatments despite the very high acoustic powers used. A small region of reduced contrast uptake on magnetic resonance imaging in one patient, and reduced perfusion color Doppler sonography in another patient indicated a possible volume of ablation. Unfortunately, these regions could not be identified confidently on histological examination, and other than some adherent Gerota's fascia and fat necrosis in the perinephric fat, no conclusive evidence of successful ablation has been found in the other three excised renal tumors. However, the sample size is too small to draw meaningful conclusions and results have been considerably more encouraging in the treated liver tumors. Treatment parameters will be adjusted as the trial progresses, and if consistent ablation continues to prove difficult, the combination approach of embolization plus high-intensity focused ultrasound as employed in China (83) will be explored. The process of developing a thermal lesion by high-intensity focused ultrasound in vivo, over sound propagation and absorption to heat generation, conduction and adequate temperature distribution, is subject to a multitude of variables. These are especially difficult to control with high-intensity focused ultrasound of renal tumors. Respiratory movement has been proven a major problem. Even with controlled ventilation placing one small lesion precisely next to the other has proven virtually impossible. Automated coordination between insonication and ventilation and "painting" the lesion with continuous insonication rather than placing one lesion next to another may further improve this. Acoustic interphases result in absorption and reflection phenomena and therefore significantly impact the site and size of the lesion. In high-intensity focused ultrasound of renal tumors overlying ribs present a major challenge. Although they only marginally influence focal position, high-intensity focused ultrasound beam and peak intensity are impacted significantly, and with direct insonication the rib may even be damaged. The use of wider apertures of the beam, directing it through the intercostal spaces, dose adjustments, and perhaps even shielding of sensitive areas with acoustic absorbers should solve the problem (86). More difficult to compensate for are acoustic interphases within the kidney, and specifically within the tumor. Structural inhomogeneity may be pronounced even in small tumors, yet is difficult to define at the time of treatment. This is obviously also the main reason for the less consistent lesioning in renal tumors than in normal renal parenchyma. This mainly impacts on lesion size (87, 88). Higher site intensities, obtained by either increasing power input, longer pulse duration, retreating the same area repeatedly or by combining these parameter modifications, appear as the most obvious solutions. Ideally, the problems could be overcome with the availability of a reliable method for assessing tissue necrosis at the time of high-intensity focused ultrasound application so that the dosage can be adapted individually. Hyperechogenic changes on gray-scale ultra-sonography signalize a high-intensity focused ultrasound effect at this point, but not necessarily complete necrosis. Presently, this can only be monitored on-line by extremely complex rapid magnetic resonance imaging thermometry (88), which appears nonfeasi-ble in a clinical setting at the time. Given current progress in ultrasound densitometry of microperfusion changes, new options may rapidly appear on the horizon. Until then the only practical solution lies in ongoing phase II clinical studies as reported herein.